Below are common attributes associated to Double Pink Knock Out Rose. Become a care taker for Double Pink Knock Out Rose! Below are member comments regarding how to plant Double Pink Knock Out Rose. No comments have been posted regarding how to plant Double Pink Knock Out Rose. Be the first! Do you know how to plant Double Pink Knock Out Rose? Below are member comments regarding how to prune Double Pink Knock Out Rose. No comments have been posted regarding how to prune Double Pink Knock Out Rose. Be the first! Do you know how to prune Double Pink Knock Out Rose? Below are member comments regarding how to fertilize Double Pink Knock Out Rose. 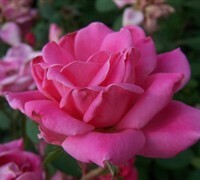 No comments have been posted regarding how to fertilize Double Pink Knock Out Rose. Be the first! Do you know how to fertlize and water Double Pink Knock Out Rose? Below are member comments regarding how to deal with Double Pink Knock Out Rose's pests and problems. No comments have been posted regarding how to deal with Double Pink Knock Out Rose's pests and problems. Be the first! Do you know how to deal with pests and problems with Double Pink Knock Out Rose? Looking for Double Pink Knock Out Rose? Get Double Pink Knock Out Rose fresh and large directly from the grower to your garden! Buy Double Pink Knock Out Rose online from the nursery wholesalers and save BIG! Pruning Knock Out Roses is easy. Not only are they the most disease-free roses in the world they are easy to care for in every other way. Knock Out Roses should be pruned heavily in early spring, just before or after new red foliage begins to emerge. At this time, cut the shrub back to about 12-18" above the ground. This ensures that the plant will have a good habit and healthy blooms throughout the season. To encourage heavier bloom, you can prune Knock Out Roses lightly throughout the active growth season to remove faded blooms. Discontinue pruning about 2 months before typical first frost date in your area. Plant Knock Out Roses in a location that provides well-drained soil and all day sun to morning sun with afternoon shade. All roses appreciate the morning sun because it dries dew from their leaves, prohibiting development of fungus and disease. That being said, Knock Out roses are the most disease-free roses in the world. Roses appreciate some shade in the afternoon in hotter climates. I fertilize my Knock Out Roses with a mild, natural plant food in early spring when the new growth begins to emerge and then about every 4 to 6 weeks throughout the season. I stop fertilizing them about two months before the first frost date. Frequent fertilization promotes increased blooming and deeper green foliage. I've seen no serious pest or disease problems with the Double Knock Out Rose. Consistently wet soil can cause problems with the roots. To plant a Knock Out Rose, dig a hole no deeper than the root ball and two to three times the width of the root ball and fill it with water. If the hole drains within a few hours, you have good drainage. If the water is still standing 12 hours later, improve the drainage in your bed, perhaps by establishing a raised bed. Turn and break up the soil removed from the planting hole. If the native soil is dense, compacted or heavy clay, mix in a good organic compost or soil amendment at a 50/50 ratio with the soil removed from the planting hole. Remove your plant from its container and carefully but firmly loosen the root ball. Set the plant into the hole you've prepared, making sure the top of the root ball is slightly above the soil level. Pull your backfill soil mixture around the root ball in the hole, tamping as you go to remove air pockets. Then water thoroughly and cover with a one to two-inch layer of mulch.